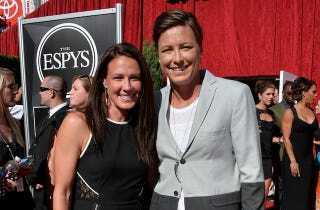 According to TMZ, USWNT soccer star Abby Wambach was wed to her longtime girlfriend, soccer player Sarah Huffman, this past weekend in Hawaii. Huffman was a soccer star at the University of Virginia, and has played in various professional leagues since graduating in 2005. She and Wambach are currently teammates on the Western New York Flash, a professional club based in Rochester, N.Y., that plays its games in the National Women's Soccer League. The wedding ceremony was reportedly held on the beach at a Kauai resort. Several of Wambach's Team USA teammates and other pro soccer players were in attendance, and based on the social media trail they left behind, it looks like everyone had a pretty great time.